Discover the best fishing spots along the river. Swimming, fishing, or relaxing along the banks of the Russian River — known locally as simply "The River" — gives visitors a chance to splash down in the middle of Sonoma County's outdoor playground. Along the way are many beaches, picnic spots, boat ramps, and access roads that make it easy to take advantage of the cool water. While some people are happy to stand on the bank with a fishing pole in hand, others take to the river in a kayak or canoe. Swim, splash, paddle, or float — whatever your preference, the Russian River beckons travelers to dip a toe into some fun. From Cloverdale in the north, Sonoma County’s Russian River meanders through a handful of towns and travels westward until it joins the Pacific Ocean in the small coastal town of Jenner. Several outfitters offer canoes and kayaks for rent, as well as guided tours. Float down in an inner tube, or merely splash along the banks. Read our extensive Guide to the Russian River Resort Area for info on activities, restaurants and hotels/camping. The Sonoma County Regional Parks system offers some of the best river access points. Admission to these parks is free but (unless noted otherwise) parking is $7 per vehicle, plus $1 per person for vehicles with 10 or more people (if large vehicles are allowed). Licensed dogs are allowed on leashes no more than six feet long. Cloverdale’s River Park is the largest public park on the Russian River with easy access from either end of town. It offers a paved and fully accessible trail along the river; a boat launch for kayaks, canoes, and drift boats; seasonal fishing; picnic areas; and great wildlife viewing. Take Highway 128/Mendocino exit off Highway 101. Follow Cloverdale Boulevard to McCray Road and turn left. Day-use parking fees apply. There is free parking at the southern entrance on First Street off Asti Road. Shady picnic areas and a swimming area roped off for the kids and watched over by a lifeguard (weekends only) make for a great day at the river. From Highway 101 northbound, exit Healdsburg Avenue. From southbound Highway 101, exit Old Redwood Highway. Parking $7. One of Sonoma County’s newest regional parks, this 300-acre site hosts a redwood grove with picnic tables, trails to walk, and lakes for fishing. From Highway 101 northbound, take the Central Windsor exit. Take Windsor River Road west to Eastside Road, make a left, heading south. The park entrance will be on your right. Parking $7. Open October through mid-May, this is a popular spot for recreational fishing.Boat launching is available (annual key and permit $45 recreational or $75 commercial for gated area). Access to the river is from a parking lot on the west side of the bridge. Parking $7. Seasonal fishing and access to the Russian River for small craft such as drift boats, kayaks, and canoes (access to gated boat launch area and permit is $45 recreational or $75 commercial). This is an excellent spot for birding, viewing river wildlife, and for picnicking. There are no lifeguards on duty at the beach area. Open from sunrise to sunset. Parking $7. Open daily from sunrise to sunset. Located just west of Mirabel Road on the south side of River Road. No lifeguards are on duty. Good ADA access to restrooms and picnic areas. Parking $7. A short trail leads to a wide beach (known locally as “Mom's Beach”), perfect for swimming and enjoying the scenery. Fishing is excellent, but challenging. A great place to spend an enjoyable day. No lifeguards on duty. Open from sunrise to sunset, parking is free. A favorite feeding spot for sea lions and seals, this is a great place to begin a kayak trip around the mouth of the Russian River. Access is at the boat ramp. Sunset in our happy place. What a weekend! Operated by the Monte Rio Recreation & Parks District, this large, ADA-accessible public beach is located beneath the Bohemian Highway bridge. Inner tubes, umbrellas, chairs, and boat rentals are available. Parking is free. A short trail leads to a wide private beach, perfect for swimming and enjoying the scenery. There's a snack bar, and a roped-off kiddies' pool. Canoes, kayaks, pedal boats, beach umbrellas, low beach chairs, and inner tubes are available for rent. Fishing is excellent, but challenging. A great place to spend an enjoyable day. No lifeguards on duty. Open from sunrise to sunset on weekends only, mid-May to mid-June; daily mid-June to early September; and weekends through the end of September. At times, closed for special events. Admission is free; parking is $5. Find more Sonoma County Beaches, Coast & Sea Villages, fishing & boating listings, and Sonoma County Parks listings. 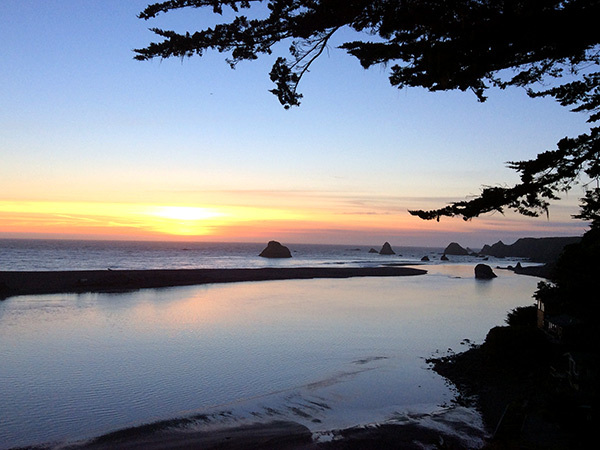 Be sure to check our Guide to the Russian River Resort Area.